We have had some interesting weather this summer, particularly some monstrous Arizona dust storms. 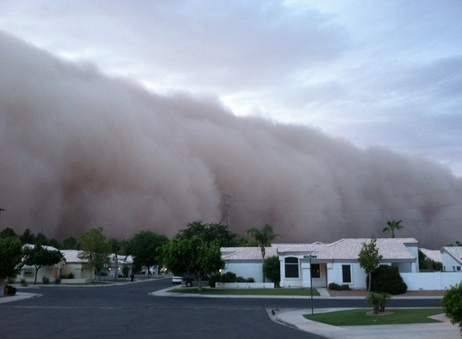 I have lived in Arizona my whole life and have seen a lot of dust storms but this one was one to remember. ....check out my back porch! This summer has brought some crazy heat and when escaping to the beach is not an option, how about a little indulgence. We pulled out the ice cream freezer to make another favorite. It’s the same basic recipe that we used in a previous post with a few minor adjustments. Chill ice cream maker canister. Cut up strawberries and cover with 1 cup of sugar (this sugar is not included in amount above). Let sit in the refrigerator for a couple of hours or until the sugar dissolves. Beat eggs well, add sugar, then add in remaining ingredients to the almond flavoring. Pour mixture into chilled ice cream maker canister. Add whole milk to just below fill line (because we are going to add the strawberries, bananas and almonds later). Freeze following manufacture instructions for your ice cream maker. When ice cream is thick and almost done, add strawberries, bananas and almonds, pushing them deep into the canister for a good mixture. Continue freezing ice cream until firm. Yummy! - the ice cream i mean! i do hope there's no dust storms when i'm in AZ in Oct! it's bad enough that we get snow storms like that - can't see anything for the white... but dust? is that like being in a sandblaster? Thanks for sharing the ice cream recipe - now to find the old ice cream maker! I've never seen anything like that! It would totally freak me out to witness it. Do you guys just know what's coming--or does everyone panic and think the world is ending? We had the worst hailstorm ever back in June, and everyone thought the sky was falling. Our neighborhood still looks like a warzone! OH MY !!! We live by the water so I have never really thought about a dust storm .... HORRIBLE !!! I would never have been able to picture it. I will take our wonderful winter blizzards any day !! I bet he first thing you do is CLOSE EYES & MOUTH !!! Yikes !! 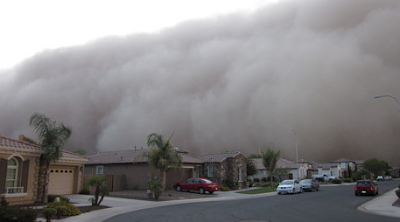 Dust storms in Arizona usually happen during the summer months. You can see a storm approaching in the distance, the sky gets a pink/tan color. They usually only last a few minutes, so you head indoors if possible. My husband and I didn't really have a choice and walked out into this one to get to our car. We had to cover our eyes and looked down following the sidewalk. It took us awhile to get the grit out of our teeth! We will be right over for some ice cream!! We had that same kinda dust storm here several months ago. First everything went dark, then a black smoke like haze appeared before the rolling dust came through. I can't believe ya'll had two of them in AZ within a month of each other. Crazy for sure. We are used to heat and dust around here; don't like it, but that's the way it is. Hazy and hot here today. Homemade ice cream is the best. When I was little and we got together at my Mammaw's in Mississippi, all the cousins would take turn turning the crank on the old ice cream maker. Peach, banana, vanilla -- yummo! Never mix ice cream with dust storms. Very sorry to hear of your extreme dust storms. I have been through several of those in Yuma years ago. The swimming pool would literally become mud. Ice cream would be the perfect way to indulge in cool refreshing delicious summer days. Wow...I remember how even little dust devils would whip around and sting; I can't even imagine the power of that beast. It really would seem like the end of the world, particularly if you couldn't get into shelter. We're pretty darn lucky here in the Pacific Northwest! Amazing photos of the dust storm. When the dust storm are over we need more of your awesome projects! Like the Junke Drawer Advent Calander. I need a challange again, please! WOW! Amazing pics of the dust storm. I made some peach ice cream not too long ago. It was yummalicious! My daughter lived there for 3 years; I showed her your post and she could not believe it. She loves Arizona but doesn't miss that! So making your ice cream today. It' expected to hit the 102° with a "feels like 110°! incredible photos...when I was a baby..was born in China Lake Ca which is a dry lake bed..my mom told me of the dust storms there..she couldn't keep the house clean..dust could get in around the windows and under the doors..it was a constant struggle..she was so happy when my dad got stationed in San Diego...heaven on earth! Wow! I've never heard of dust storms in Arizona - amazing (and yucky!). But that ice cream sure looks like a good cure for anything! Enjoy!